As a girl in Liverpool in the thirties, the name Sir Giles Gilbert Scott was very familiar as the designer of Liverpool Cathedral and the tower which was beginning to rise up high in the City. So it has given me pleasure each night to look out of my bedroom window and see the friendly little light in the kiosk right opposite. 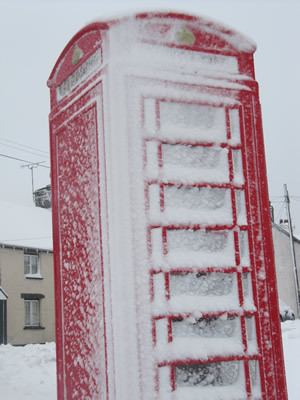 This type of telephone box was designed by Sir Giles Gilbert Scott in 1936. Situated as it is by the river, the 18th century bridge (listed) and opposite the old Post Office - a Grade II listed building - it seemed so much more in keeping with the old houses in the High Street than the new B.T. kiosks. So I approached C.A.D.W. 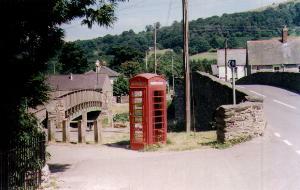 and they, together with Glyndwr District Council, have made our kiosk a listed building, to stay there forever. 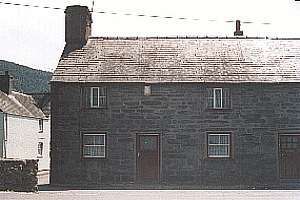 It is in a spot convenient to everyone, in the centre of the village, where small change can be had from the Post Office and where customers leaving the Dudley Arms can ring for a taxi. Noticing its cheerful red colour, matching the pillar box and the Post Office, many cars stop on the wide road and visitors go on to the bridge to look at the river or sit on the seats by the river's edge.